Founded by Mick Sinclair, Cool-Cat-Daddy-O was initially a vehicle for the Funboy Five single ('Life After Death'/'Compulsive Eater', Phun 1) but developed to include numerous other projects such as cassette-only releases, a current affairs fanzine, and several other ideas which never quite came to fruition. 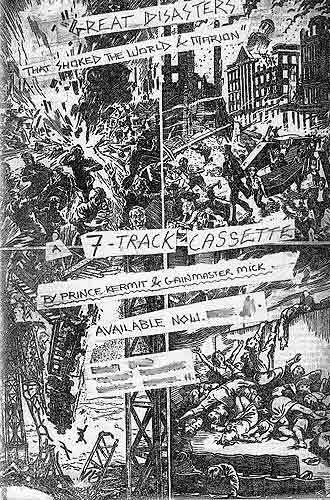 'Great Disasters That Shook the World & Marion' a cassette-only release from Prince Kermit and Gain-Master Mick. The 7-track collection found the duo re-creating great disasters that did indeed shake the world. 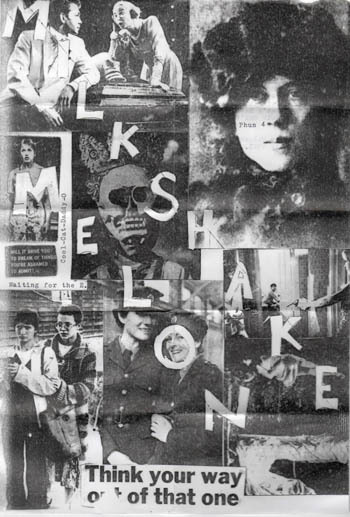 And 'A Cassette by Milkshake Melon' – a continually evolving cassette-only release from the alter-ego of Mick Sinclair that purchasers could return for updates and additional tracks. Curiously, many who heard it, including several music journalists who reviewed it, assumed it was an entire band rather than one person and many overdubs. More recently, some have mistakenly listed the title as 'Waiting For the E.', which is actually a good title but comes from an misreading of 'Waiting For The E.P.' which was typed onto the photocopied sleeve. We are, of course, still waiting for the E.P.. In 2014, Cool-Cat-Daddy-O re-announced itself with a new Funboy Five vinyl single 'Save The World'/'What Did You Do With The Body?' (Phun 2101), and followed this in 2015 with digital-only Funboy Five singles, 'Radio Free Asia' (Phun 2102), 'Ramptonesque' (Phun 2103), 'Kermitose' (Phun 2104), and 'Vipers Of The Commonwealth' (Phun 2105) with more to come.